Tai Chi has really taken off in the past 20 years. People do it every where in the world. There is even a World Tai Chi day that is on April 29th, where all major cities in the world participate in a group effort at parks or public places. One of the most inspirational Tai Chi animation is Kung Fu Panda. Po is the unbeatable Tai Chi master that is flexible and nimble! These days Tai Chi is normally done for health so most of its Martial Art root is forgotten. The purpose of this website is bring Tai Chi back to its root so it can be better appreciated. Tai Chi is short for Tai Chi Quan. “Tai” means very or extreme. This “Chi” means potential power. (Not to be confused with Qi which is energy.) “Quan” means fist that can be translated to mean martial arts. Quan is commonly translated to mean “boxing” which is wrong. The correct way to pronounce Tai Chi is Taiji. Tai Chi is a non-aggresive martial art that teaches you to understand yourself. Tai Chi focuses on grace, harmony and self control (inner peace.) Taiji is continuous and ever flowing, unrestrained and expressive. Tai Chi teaches you how to strengthen your own body through your own energy called Qi. Tai Chi strengthen and conditions the body while also building flexibility and coordination. Tai Chi is an internal martial art. Another name for internal martial art is soft martial art or in Chinese we call it Nen Quan or “Soft Fist.” This kind of martial art focus heavily on flexibility and agility. Tai Chi forms are a tool for many things. Initially it is to move the Qi in the body to open channels and strengthen the body. Because of this Tai Chi is a form of Qi Gong in the early stage. There are many forms in Taiji. There are weapons forms and there are barehand forms. Each Tai Chi form itself has a specific purpose just like every movement in Tai Chi has a specific purpose. Not only is Tai Chi good for the body but Tai Chi also stimulates the mind and bring mental awareness. This mental awareness calms the Shen or spirit. Throughout history Chinese martial arts (Kung Fu) were kept secretive among the family or within the disciples of the school. If it was taught outside the school, the true essence of it was not revealed until you were accepted in the inner sphere as mentioned by Master Yang Yang in this good article as so from my experience myself. There are students and there are disciples……. Next time when you train in Taiji. Ask yourself are you just memorizing a choreographed movement or is there essence and foundation to it? Many of the Tai Chi today in America is commercialized and lack good foundation. Which lead to instructors creating “their” version of Tai Chi. I believe many aspects of Tai Chi has been misunderstood because of improper teaching which eventually leads to its degradation. This is my journey to Tai Chi & Qi Gong. 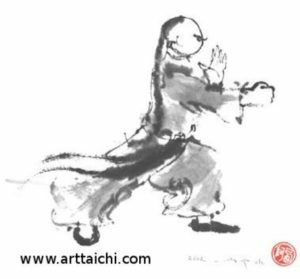 From my training of 30+ years I have discovered that Tai Chi is an art. The more you train, the more you appreciate Tai Chi and its benefits. This website will continue to grow as I have more time to write more………. Please come back and visit the site again!